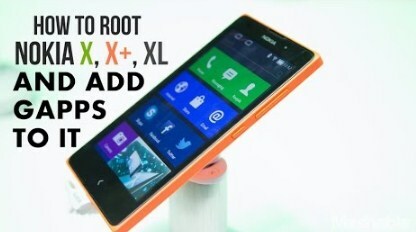 You may want to get Gaaps on your Nokia XL but you do not want to root your phone. Well, you are able to do that. You just need to follow the instructions that we have prepared in the next paragraph. The process is a little bit complicated, so follow the steps carefully. The first thing that you need to do is to Enable USB Debugging mode. To do that, go to Settings, tap Developer options and then in the Debugging section, Enable USB debugging. After that, you need to open and download Microsoft.Net Framework version 4.5.2 or you are also able to download the later version and install it on your PC. Now, you have to download Nokia X Manager and install it on your PC. After you download “Nokia XL Rooting Rooting With Play Store.rar” file, you have to extract it on your Pc using winrar. After you extract the file, now you have to open Nokia XL Rooting With Play Store folder and you will see there are two files in it. Now, you have to install Nokia X Manager on your computer by running “Setup_NokiaXMgr_v1.1.0.0” setup file. If you have installed it, open Nokia X Manager on your computer and it will show “Waiting for device”. In this step, you have to connect your Nokia XL via USB Data cable to your computer and wait until Nokia X Manager detects your phone. You have to tap “Install GApps” when Nokia X Manager show that your device is connected. Then, a window with a message will open and you have to hit OK. Now, another window will open to locate GApps file. Now, you have to find Nokia XL Rooting With Play Store folder which you have extracted and open it. Then, you will find ” Nokia_X_Toolkit_v1.00″ folder and you have to open it again. Then, open “gapps” folder and you will find 2 ZIP files. Choose “Nokia-X_GApps_Install-signed” zip file and hit Open. Wait until process of Nokia X Manager finishes. If it is done, click OK on a window called ‘next step to do’. Your phone will be rebooted temporarily o TWRP to install “NokiaX_Gapps_Package.zip” file. When it is rebooted, make sure that the screen is not turned off automatically. Now, you have to hit Mount. Press Mount USB Storage and make sure to take out USB Data Cable after pressing Mount USB storage. In this step, you have to hit Unmount and then hit Back Key. Hit Install and it will take you into your Internal Storage to locate NokiaX_Gapps_Package.zip file. Scroll down and then you will see NokiaX_Gapps_Package.zip file. Then, you need to swipe to confirm flash and it will begin processing. After finishing the process, hit Reboot System. Well, you have to be patient to do the process because it is a little bit complicated. You can also get Gapps on your Nokia XL by rooting your smartphone first. If you do not mind rooting your phone before you install Gapps on your smartphone, you are able to use the tutorial which we have written in another article in this site. Related Post "Nokia XL Gapps without Root"